This past week, two amazing worlds collided! Rhubarb. And ice cream. Rhubarb is my returning springtime friend, especially now that I have my own plants again. It's definitely no secret that I love ice cream. I make it year round, but the warm weather makes me feel like it's a little more appropriate to be making now. I made my Gingersnap Maple Pecan variety on many days this past year while the snow was flying. Let's think of that flavor as my cozy eat-in-front-of-the-fireplace variety. If you've followed this blog you'll also know that I am also a huge fan of Tiger ice-cream. This strange orange and black licorice combination that some people haven't even heard of is one of my favorite bring-me-back-to-my-childhood varieties. This new flavor screams spring and summer to me. I'm hoping this will become my serve-to-company-for-a-backyard-bbq-dessert variety. 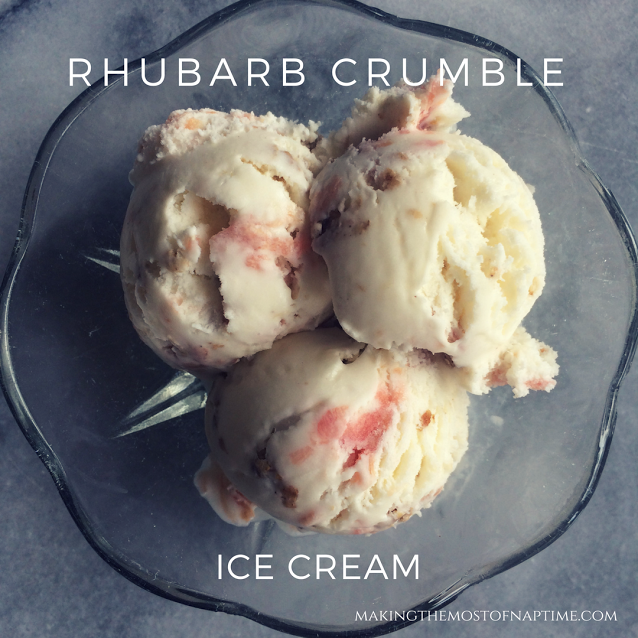 If you close your eyes, it actually tastes like you're taking a bite of fresh rhubarb crumble with a scoop of vanilla ice cream on top. What?! Yes! I made my first batch of this last week, and every family member agrees that this is a keeper. My five and three year old kiddos give it a full endorsement of greatness. Keep in mind that these are two children who think strawberry ice cream is disgusting.... so they don't give just anything a thumbs up! First, prepare your rhubarb mixture by combining the rhubarb, sugar, and water in a small pot. Bring to a boil over medium-high heat, stirring occasionally. Reduce heat to low and allow the rhubarb to simmer until it is soft and breaking apart, and the mixture has reduced slightly and thickened. This should take just shy of 5 minutes. Transfer to a small bowl or measuring cup and allow to fully cool. Next, prepare your crumble mixture. In a small frying pan, melt the butter over medium-high heat. Add oats, brown sugar and cinnamon. Crank the heat up a bit and stir to fully coat the oats in the butter/sugar mixture. You'll start to smell the sugar cooking and see it bubbling as it is coating the oats. Once you can see this bubbling, sizzling awesomeness (less than a minute), remove from the heat and transfer to a small bowl. Place in the freezer to fully firm up and cool. This is important because I have found that a semi-frozen ice cream add-in keeps the original crispy and delicious texture when incorporated this way. While your rhubarb and crumble mixtures are cooling, make the ice cream base. Whisk together creams, sugar and vanilla extract in a medium sized bowl. Add to your ice cream maker (you'll need a 2 qt capacity machine) and freeze according to manufacturer's directions. Mine takes between 25 to 30 minutes. In the final couple minutes of processing (in my Cuisinart, this is at the 25 minute mark), add the crumble mixture, and allow to fully mix in for a minute or so. You may need to lightly break up the bigger crumbs with your fingers once you take it out of the freezer. After the crumbs are mixed in, it's time to swirl in your rhubarb mixture. I like to do this manually in the container to control the placement of the swirls. I find that if you dump it into the machine it blends them in too much. To swirl your ice cream, spread half of the ice cream mixture into the airtight container you're planning on freezing your ice cream in. You'll need a container that holds slightly more than 1 quart (4 cups). I use a 4.5 cup capacity container with a tight fitting lid. So, after you have half the ice cream spread in the container, drizzle half of the rhubarb mixture over top. Take a knife and cut through the drizzle and ice cream, moving your knife in a zig-zag pattern. Spread the rest of the ice cream on top of this layer, drizzle the remaining rhubarb mixture, and then repeat the step with running a knife through in a zig-zag pattern. Cover and freeze for 4 hours.